We headed further north after the stunning Kings Canyon to Alice Springs as we wanted to spend some time relaxing (doing very little for a change) and having the much-needed repairs done to the LR Discovery from an Emu encounter we had a few days earlier. We had to get some welding done to the Bull bar, broken lights replaced, left steering arm & wheel alignment attended too and other bit and pieces all as a result of the unexpected “coming together”. I had always thought these lovely animals were simply feathers and air – how wrong I was. Nonetheless, I’m sure we’ve all heard or experienced how things take longer in the bush to happen, and often they do. In our case of our repairs, they took an eternity in the Alice …and with a wry smile from the 4WD specialist sales person, “welcome to NT“! After waiting in Alice for 7 nights (4 more than our plan) our parts had still not arrived with no knowledge where they were. In the end, I contacted the manufacturer directly in Brisbane and ordered our replacement parts myself and they are sending them onto Broome for us. And by a sudden turn of good fortune, in exchange of sending the bull bar manufacturer (Plug – ECB) photo’s of the emu damage to their bull bar on our D4, they suggested giving us the replacement parts (a few hundred dollars in cost) free of charge. We happily obliged. 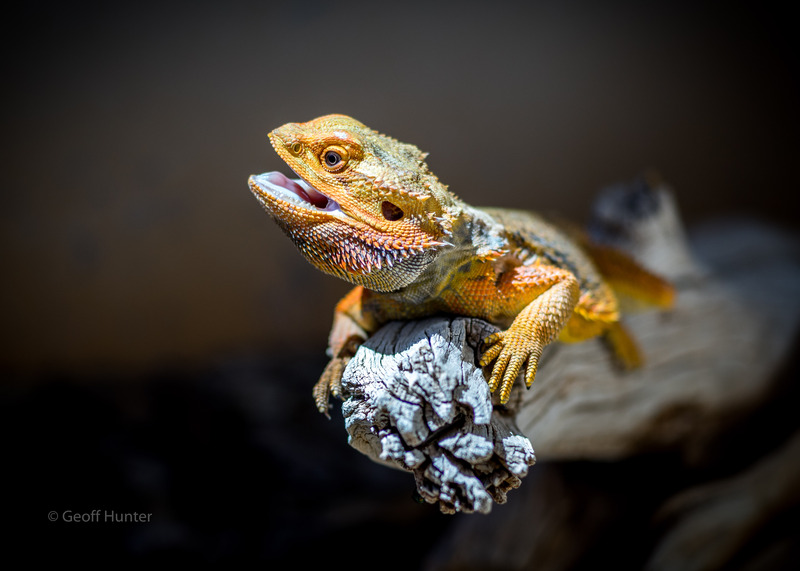 One attraction we enjoyed the most was a visit to the Alice Springs Reptile Park in the heart of town. A rather small facility however with great exhibits of all things deadly (and some not so deadly) to get up close and personal with, and the highlight/s being the central bearded dragons (see below) and Thorny Devils – the latter of which we have sadly not yet seen in the wild on our trip – perhaps we will in WA? We ended up leaving Alice without all our repairs completed but at least the D4 was safe and roadworthy and we drove 550kms to north of Tennant Creek to a free camp ‘The Pebbles’. On the way, we passed through a station called Aileron for a 10 minute break. Celia asked the station owner if he had “a bathroom” she could use and with a long pause and puzzled look on his face, he quickly retorted, “oh, you mean a S**thouse” Sure love, we even have one of those out here. (Only in the bush – awesome we thought, and Celia and I joyfully relived the moment for hours afterwards). Tomorrow however was another long day with us taking on the infamous Buchanan/Buntine Hwy’s to Top Springs (Hwy’s my foot …but more about these rough and fascinating outback tracks in the next post). Great shots Geoff, happy birthday Aidan, we miss your electric fence testing skills. Have you photo shopped your van and car into the photo. They look far too clean. Wish we were there…next year. Good work doing the admin job outback Sis with the LR! Stunning lizard photo Geoff! Would love to see a photo collection of the various outback “sh..houses” Aussie style! PS We are all hanging out for a ‘night sky’ shots too if possible. Great to see all the fun you’re having, all the way from cold and cloudy England. Geoff, what a fantastic photo! !